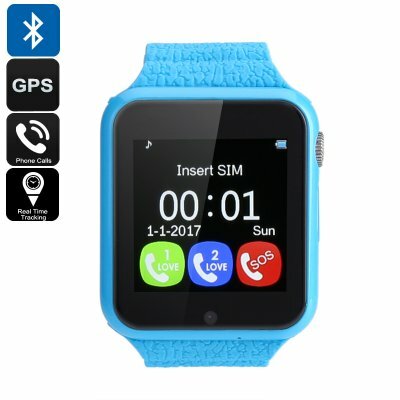 Successfully Added VK7 Kids GPS Smart Watch - GSM SIM, Twitter, Facebook, WhatsApp, Realtime Tracking, GPS+AGPS+LBS, Geofencing (Blue) to your Shopping Cart. This quad-band GSM smart watch with GPS tracking real-time trajectory and geo-fencing keeps an eye on your child's whereabouts without intruding on their privacy. In today's world strapping a GPS watch to your child's wrist is a perfect way to keep them safe. Being able to monitor their current locating brings peace of mind and with real-time monitoring and trajectory, you'll always know just where they are heading. A free app for Android and iOS put you firmly in control and give you access to all the tracking and management functions. The VK7 kids watch can be fully managed from a smartphone app allowing you to set geofencing areas, authorize contact numbers and phone calls as well as retrieve location data. With a GSM SIM card slot and GPS+AGPS+LBS location modes, the smart watch can be tracked almost anywhere. Thanks to the SOS function and geo-fencing you can be alerted if your child needs you or if they wander out of a preset zone. What'sApp, Twitter, and Facebook bring social media to the phone watch and so it's ideal for teens who want keep connected with friends but may not be allowed a smartphone out at school. There is enough space to store up to 200 contacts will be enough for their circle of friends as well as relatives and you can prescreen the contacts and even blacklist numbers to stop harassment of your child. With a pedometer, sleep monitor and sedentary reminder you'll be able to see just how active your children were and help ensure they get a full quota of sleep. A slender build makes this kid watch comfortable for all day wear while the vibrant color and Apple watch styling will appeal to your kid's fashion sense. A 380mAh battery offers up to 72 hours of standby time so a single charge will be enough for a day's usage. The VK7 children's smart watch and GPS tracker comes with 12 months warranty, brought to you by the leader in electronic devices as well as wholesale kids watches and GPS trackers..